It took two years for Pope Benedict XVI to give his first full-fledged news conference. And when he finally held one on , he caused a stir with his comments on abortion. Benedict stood before 70 journalists on his Alitalia jetliner headed to Brazil on the first long trip of his papacy. Responding with quiet certainty, he answered 11 questions in 25 minutes. Initially he steered clear of controversy insisting, for example, that "I love Latin America" when asked why it took him two years to make his first papal visit to the region where half of the world's 1.1 billion Catholics live. But when an Italian reporter pressed him on whether he agreed that Catholic legislators who voted to legalize abortion in Mexico City should rightfully be considered excommunicated, he caused a furor that led his spokesman to try to downplay his response. "Yes," Benedict replied. "The excommunication was not something arbitrary. It is part of the (canon law) code. It is based simply on the principle that the killing of an innocent human child is incompatible with going in Communion with the body of Christ. Thus, they (the bishops) didn't do anything new or anything surprising. Or arbitrary." The response seemed to take one side of an active church debate on canon law, and media dispatches filed from the plane caused an uproar of sorts, with some scholars challenging the pope's apparent position. For example, the Rev. John Coughlin, a law professor at the University of Notre Dame, said there is no provision in canon law saying that Catholic politicians who vote to legalize abortion automatically excommunicate themselves. Vatican officials later said the pope might have inferred from the question that the Mexican bishops had issued a formal declaration of excommunication for the legislators, something Mexican Cardinal Norberto Rivera has said he has no intention of doing. Benedict's spokesman, the Rev. Federico Lombardi, said the pope was not setting a new policy and did not intend to formally excommunicate anyone a rare process under church law that is separate from the doctrine of self-excommunication. "Since excommunication hasn't been declared by the Mexican bishops, the pope has no intention himself of declaring it," Lombardi said in a statement approved by the pope. But Lombardi added that politicians who vote in favor of abortion should not receive the sacrament of Holy Communion. "Legislative action in favor of abortion is incompatible with participation in the Eucharist. ... Politicians exclude themselves from Communion," he said. It was not the first time that Benedict appeared to speak directly, only to backtrack or refine his original statement. The most controversial example occurred when the pope, speaking in Germany, raised the issue of Islam and violence. After anger spread across the Islamic world, Benedict said he did not intend to offend Muslims. While Benedict frequently condemns violence in the name of religion, he has never again pointed the finger explicitly at Muslims. But this pope's apparent candor can get him in trouble, said John L. Allen Jr., a reporter with the National Catholic Reporter. 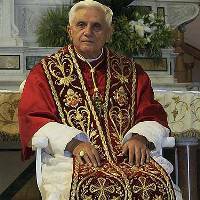 "Benedict doesn't seem to distinguish when he is speaking as Cardinal Joseph Ratzinger and when he is speaking as the head of the Roman Catholic Church," Allen said. The pope acknowledged that many neither agree with him, nor listen to his teachings. "In all parts of the world, there are those who don't want to hear," Benedict said. "Naturally, even our Lord did not manage to make everyone hear."